Etching House – Tim Storrier BUNCE BALANCING MANGO AND BANANA, image size is 59X95.3CM, this work is a fine art limited edition of 250 reproduction prints, HAND signed and titled by Tim Storrier they come complete with a certificate of authenticity. These images are ultra high quality and really represent exceptional value, they are stunning when framed. These are fine art limited edition reproduction prints of the original painting by Tim Storrier. 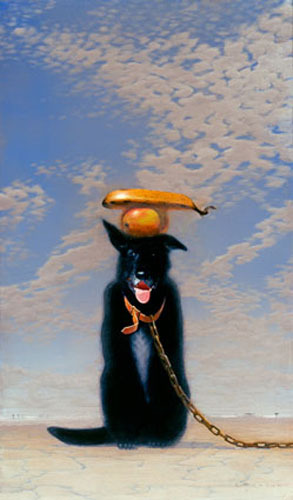 Bunce Balancing a Banana available at Etching House.